I am primarily interested in American urban history of the nineteenth and twentieth centuries. Specific areas of interest include issues of race and ethnicity, ownership and navigation of contested spaces, and the way technology shapes and impacts the urban environment. My dissertation seeks to understand the integration of computers into the educational system from 1965 through 1999, exploring the perspectives of students, parents, teachers, and the corporations producing educational software. 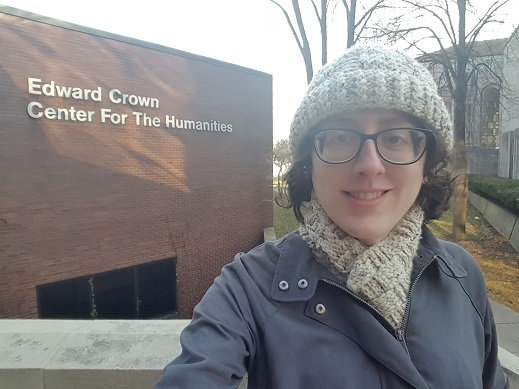 "Decolonizing the Archive: The May Weber Collection in a Digital World," poster presentation with Dr. Catherine Nichols at the Chicago Colloquium on Digital Humanities and Computer Science, Fall 2018. "Mainframes and Microcomputers: Early Computing Technology in American Education," presented at Loyola University Chicago History Graduate Student Conference, Fall 2018. Moderator for "Addressing Accessibility after Design," panel discussion at Loyola University Chicago Digital Accessibility conference, Spring 2018. Panelist Commentator for "An Afternoon at (Virtual) Walden: A Panel Discussion with Tracy Fullerton (USC)," for the Loyola University Chicago Center for Textual Studies and Digital Humanities, Fall 2017. "Windy City Underground: The Forgotten Freight Tunnels of the Chicago Tunnel Company," presented at Loyola University Chicago History Graduate Student Conference, Fall 2017. "A Network of Air in the Windy City: Chicago's Fleeting Pneumatic Age," presented at Eighth Biennial Urban History Association Conference, Fall 2016. "The Lynching of Henry Smith: Violence and Managed Messaging in Paris, Texas, 1893," presented at University of Michigan Graduate Conference in U.S. History, Spring 2016. "Keeping Austin White: The Formalization of Segregation in Austin, Texas, 1900-1930." In Essays on Race, Gender, and Politics in World History, edited by Sace Elder, 183-212. Champaign: Common Ground Research Networks, 2017.